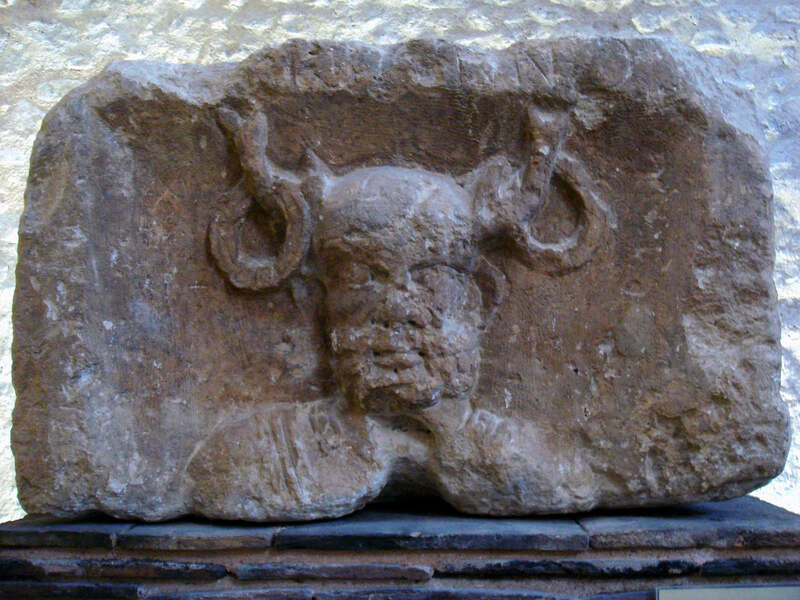 Articles | The Evidence for Cernunnos? Anyone who has encountered Wiccan theology will be familiar with the concept of one goddess and one god of whom other goddesses or gods are but aspects. The god is generally pictured principally as horned, and usually called Cernunnos. But many pagans may be surprised to discover that this specific concept of the horned god appears to be a little more recent than many might think, as it derives from the writings of Margaret Murray, in the 1920s. Following the success of her popular book The Witch Cult in Western Europe1, published in 1921, Murray followed it with The God of the Witches ten years later, in which she popularised the idea of a Horned God whose worship dated back to paleolithic times. Although discredited at the time by her academic colleagues for its lack of any critical analysis of source material, this work gained popularity after the repeal of the Witchcraft Act in the 1950s. In the book, writing about Cernunnos, she states "… in spite of his Latinised name, [Cernunnos] was found in all parts of Gaul…It was only when Rome started on her career of conquest that any written record was made of the gods of Western Europe, and those records prove that a horned deity, whom the Romans called Cernunnos, was one of the greatest gods, perhaps even the supreme deity, of Gaul… Cernunnos is recorded in writing and in sculpture in the south of Gaul…" The purpose of this article is to make a brief survey of the existing pre-Christian evidence for a cult of Cernunnos, and what that evidence tells us. Perhaps the first thing to say is that there is no evidence that the idea of gods being other than separate individuals was popular until possibly the rise of neo-platonism in the third century common era. Classical literary sources, such as the Greek dramatists, Hesiod or Homer, Insular works such as the Book of Invasions or the Mabinogian, or the Icelandic Eddas all treat the gods they describe as individual. This article is written on the same basis, rather than one which assumes that one horned god might be the same as another – or, indeed, the same as any god, whether horned or not. There are less than two dozen known artefacts which display images which might be taken to be Cernunnos, and four inscriptions mentioning him by name. These are spread over the UK and Western Europe, with by far the greatest number originating in ancient Gaul. It is not know whether Murray's confident claim that Cernunnos is recorded in writing implies contemporary literary sources other than the inscriptions but, if it does, none have been discovered. Although the number of finds (when compared to the evidence for other pre-conquest Gallic gods) is quite large, and probably supports the claims for a widespread cult, there are parts of France which contain no finds and it is unclear why Murray says "Cernunnos is recorded in writing and in sculpture in the south of Gaul…" because only one inscription is from the south of Gaul. Most are in the north-east. If there is a cult centre then, based on the evidence we have, it lay in central and eastern Gaul. But Gallo-Roman religious sculpture of all kinds, and not just of Cernunnos, is concentrated in the north-east and north-central Gaul. The next problem lies in identifying when an artefact is, indeed, meant to represent Cernunnos. The name is only given on three or four inscriptions, of which one, the Parisian pillar, includes a carved image. This Pilier des Nautes (Pillar of the Boatmen) provides the earliest written record of the name 'Cernunnos'. Although the first letter of the name is defaced, it is probable it was Cernunnos on the basis of linguistic and other archaeological evidence. Linguistically, the Gaulish word carnon or cernon means 'antler' or 'horn'. This can produce the names Carnonos, Deer-Hoofed One or Cornonos Horned One. The central syllable 'on' denotes a deity, as in Epona or Maponos, and would only have been replaced by 'un' to provide a Latinised form of the name for inscriptions in Latin. Latin was the common language of Roman Europe and names mentioned in Latin texts are converted to a Latin form, which does not imply, as Murray seems to indicate, that a god was commonly recognised by the Romans. Of the remaining inscriptions, two on metal plaques from Seinsel-Rëlent (Luxembourg) give an alternate rendering of 'Deo Ceruninco': "to the God Cerunincos". And the last, a Gaulish inscription written in Greek letters from Montagnac (Hérault, Languedoc-Roussilion, France) provides an Hellenistic form of the name (Karnonos): "αλλετ[ει]υος καρνονου αλ[ι]σο[ντ]εας.” These inscriptions provide us with no further information about the god. It was common at the time to have a statue or relief made in devotion to a god, usually in fulfilment of a vow. Many examples of this can be seen in the baths in Bath. The Parisian pillar was erected by a Gaulish guild of boatmen who lived among the Celtic tribe of the Parisii and controlled trade along the Seine. 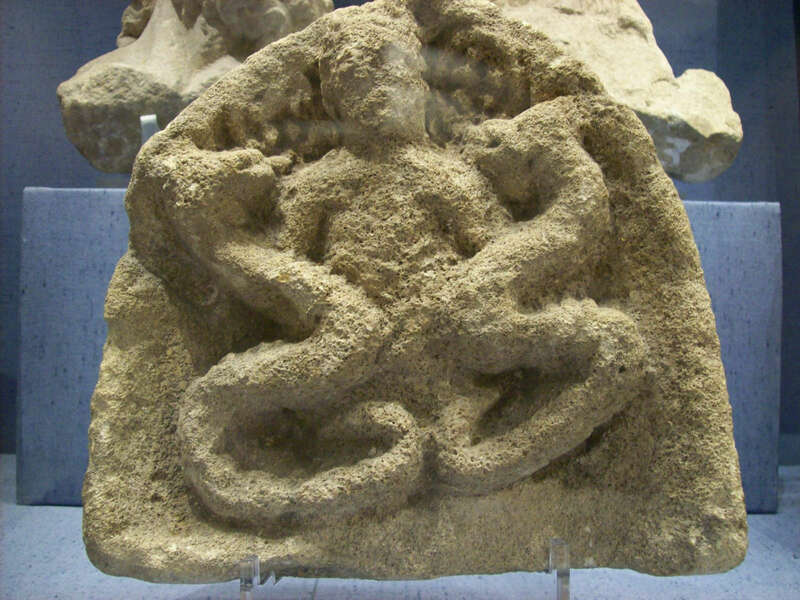 The image included on the Pillar of the Boatmen also introduces other features, such as torcs hanging from the horns and, reconstructing the lost lower half of the relief, it is probable that the deity is pictured sitting cross legged. Although one face of the pillar includes this image Cernunnos in its top half, others feature other gods, and the inscription mentions many gods, some Roman, some Celt. Horns are generally the pre-eminent symbol most people would associate with Cernunnos. Although at least one image which contains other features, such as sitting cross legged or arms raised in the 'orans' position familiar from the Gunderstrup Cauldron, has what appears to be rams horns, he is more usually associated with antlers, especially of the red deer. The difference between the two is profound, as antlers are shed seasonally, whereas horns are not. This is clearly a difference which is significant as the statues from Etang sur Arroux, Condat and Sommerécourt all have holes as though to fit removable antlers, and separate antlers have been found elsewhere. This indicates that the seasonal nature of the god was sufficiently important for some devotees to have the means to alter the image to reflect that. 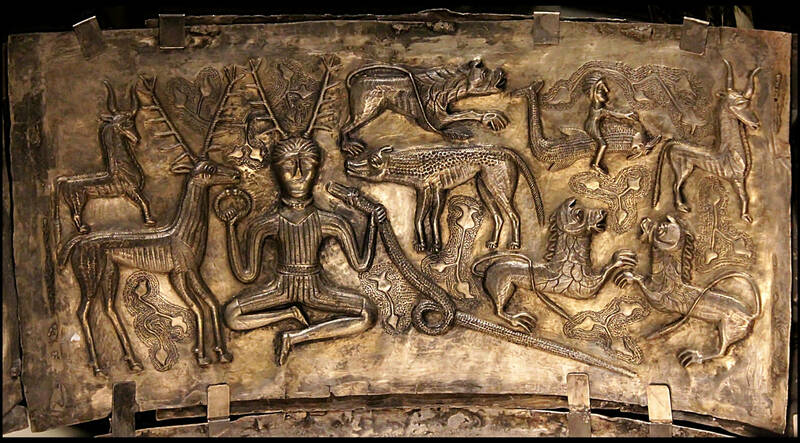 But what did antlers mean to the ancient Celts? Unfortunately, it is quite difficult to assign precise meaning. We might guess that virility was part of the symbolism however, as at least two images of antlered goddesses have been discovered, and the removal of horns would argue against the symbolism of a personal aggressive male sexuality being the pre-eminent image. On the other hand, the bull as well as the stag appears on the reliefs from Saintes, Reims and Les Bollards. Among other theories, one of the most popular is that Cernunnos was Lord of the Hunt, and the bulls may represent the wildness of such animals as the boar and the stag existing within some domesticated settings. The common position of cross legged poise, seen on the images from Etang, Saintes and Vendoeuvres, especially when associated with the arms raised in a Buddhic style, as seen on the Gunderstrup Cauldron, seems to contradict this wildness. In at least three other images he is seated on a bench, in a style familiar to those who have seen images of The Matronae, and we gain an impression of a more peaceful deity. It has been pointed out that sitting cross legged might be a normal position for a Celt who was hunting. Without more evidence it is hard to judge. However, in at least three of the artefacts in which he assumes this pose, he is also accompanied by the ram headed snake, and this may tell us something more. There is some conjecture about the meaning of the symbol. Snakes were commonly associated with a number of symbols: fertility, death, the underworld and regeneration (the last through the sloughing of the skin). 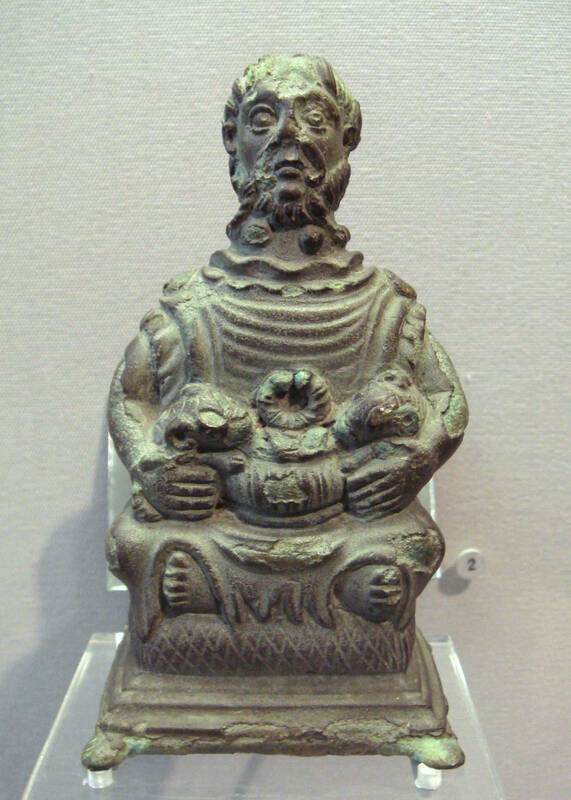 The Graeco-Roman god associated with healing, Asklepios, used the snake as a symbol of healing and the underworld, and it appears with the Celtic goddesses Sirona, who is associated with healing, and Damona, who is associated with farming and the sleep of healing used at shrines and springs. The ram is associated with Mercury and battle. Miranda Green suggests it is also a symbol of aggressive virility. Miranda Green 2 also notes that this symbol is found mainly in North Eastern Gaul, which also produces a lot of the evidence for the cult of Cernunnos. Three of the images fall within this area, with at least another two, of ordinary snakes, falling outside it, and two ram horned snakes – including the two earliest images – falling outside of France. One of these is the Gunderstrup Cauldron, which is dated to the 1st or 2nd century BCE, while the other is the earliest find, from the Camonica Valley in Italy and dated to around the 4th century BCE. Although a number of online articles claim there is a unique association between Cernunnos and the ram horned snake, this is untrue. It is found in conjunction with other gods, especially the Celtic Mercury and Mars. 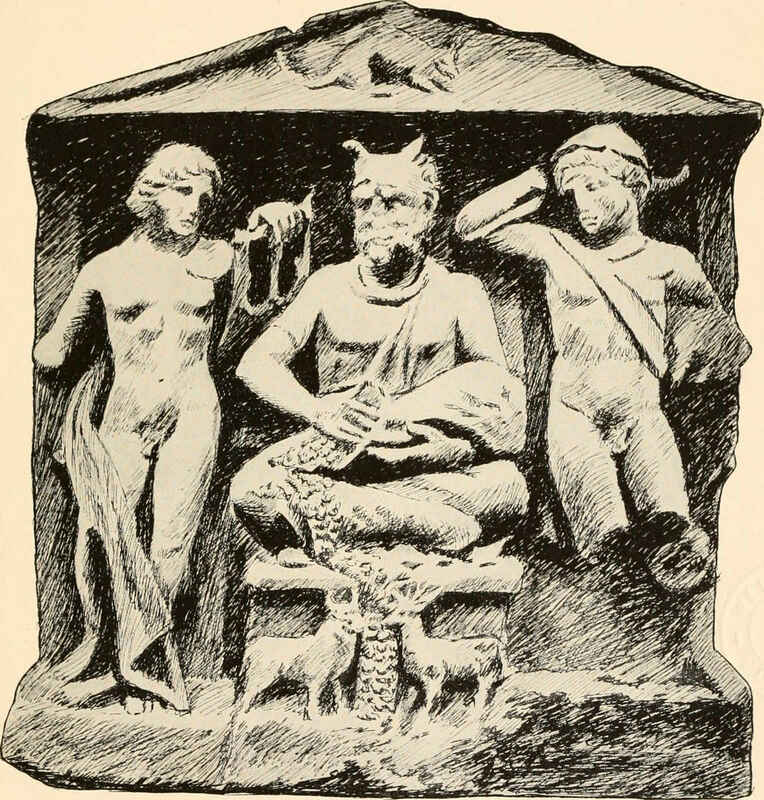 According to Green, the Celtic Mars was a protector and healer as well as a warrior, and who is accompanied by the ram horned snake on an image found at a healing spring. This snake also appears twice with the Celtic Mercury, associated with wealth and healing, one of these finds again being at a healing shrine. Mercury also shared with Cernunnos a direct association with wealth, and a less direct association of triplicity by his iconography being found on several occasions associated with triple headed figures, and he is found alongside Cernunnos on the Reims relief. The cult of the head amongst the Celtic peoples is commonly known and the triplicity of heads or faces seems to denote a sign of wealth, or an intensifying of something or, occasionally, a multiplicity of interests. It is difficult to be prescriptive as it appears to have a number of possible meanings. Among other suggestions for Cernunnos has been a Celtic triad of fertilization, maturation, and harvest, or birth, life, and death. But as there is no indication on the images we have of what this meant, it is impossible to be certain. However, it seems to be a common feature of most representations and occurs in those found at Nuits St George; where he is triple faced, Beaune, where his companion is triple faced; Etang sur Arroux, Langres, Condat, Denevy and on the Les Bollards relief. 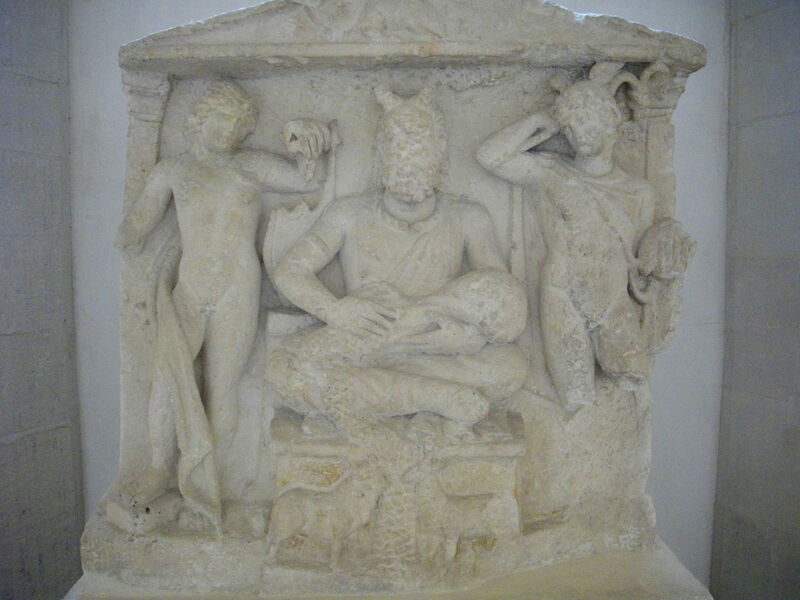 Although he has only one face on the Reims relief, he is flanked there by the two figures of Apollo and Mercury, and by two boys on the find from Vendoeuvres. I have mentioned wealth in connection with the triplicity of heads or faces, and this may well be an emphasis of the wealth which is expressly associated with him in numerous images through sacks of coins, torcs (two on the horns in the Paris image, or one on each arm in the Italian one), feeding snakes, or, fairly explicitly, a stag vomiting coins in the representation from Niedercorn-Turbelslach in Luxembourg. The Pillar of the Boatman links him with sailors and commerce and, again, one recalls the association with Mercury in the Reims relief. As mentioned, Mercury is associated with healing and holds his caduceus of entwined snakes; he is also usually identified with the Greek Hermes, who, amongst other things, was a psychopomp, who escorted the dead to the underworld, as well as being a divine keeper of herds. Apollo has a strong association with healing, and fathered Askeplios, as well as being associated, in the Celtic world, with the goddesses Sirona and Damona. The last great symbol of Cernunnos, of course, is that of animals. Pre-eminently the stag, although other representations include bulls, a boar, rat, hare, dog, dolphin and lions. As mentioned, this gives rise to the commonly held attribution of the god as Lord of the Hunt and, since hunting involves death, a connection with the underworld. 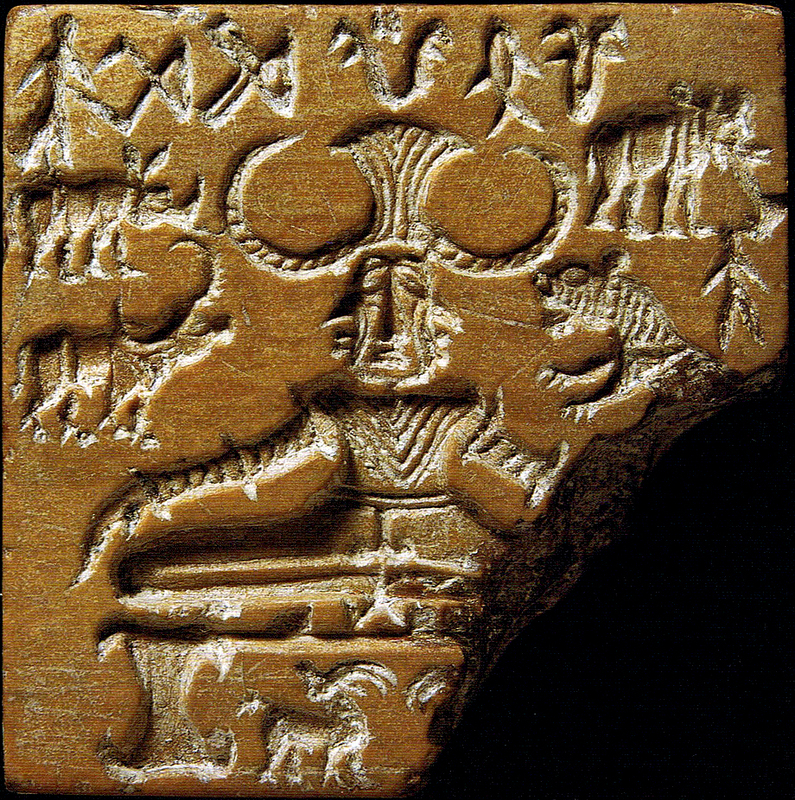 The image of the Gunderstrup Cauldron is often compared to that of Shiva Pashupati, the Yogic 'Lord of Beasts', as shown on at least one well known image, the Marshall Harappan seal. In this the horned Pashupati is surrounded by animals and has his legs crossed. The resemblance is striking and may have influenced the design of the Cernunnos plate of Gunderstrup, which may have its origins in Romania or Thrace, which stood between Greece and the east. If there is a connection with the underworld, does this raise a possible connection with the Celtic god Dispater? When Murray referred to Cernunnos as “one of the greatest gods, perhaps even the supreme deity, of Gaul…Cernunnos is recorded in writing” she may have been referring to Caesar’s words in The Gallic wars, of the Gallic gods: "They worship chiefly the god Mercury… After him they worship Apollo and Mars, Iuppiter and Minerva. About these they hold much the same beliefs as other nations. Apollo heals diseases . . . All the Gauls assert that they are descended from Dispater, their progenitor." Unfortunately, we have little evidence to help us with Dispater, other than his name is obviously a reference to a god of the dead, and to wealth, which comes from the earth. The Roman god most commonly identified with Dispater was Iuppiter (Jupiter), and, although this name also appears on the Piller of the Boatmen, it is in addition to the names of several other gods. The identity of Dispater remains elusive, and some people more readily identify him with the Irish gods Donn or the Daghda. So where does all this take us? The first and most obvious comment is that we cannot be certain. However, it seems fairly safe to say that it appears, on the basis of what we have evidence for, that Cernunnos was directly associated with divinity, wealth and animals, and potentially indirectly associated with regeneration, healing, fertility and death. We have little to explain the cross legged pose so characteristic of many images, although it may relate to either a common Celtic position of a hunter, or to something more akin to Buddhic calm. All of which is not only far from Murray’s certainties, but also from some of the symbology commonly associated with the Wiccan 'horned god'. 1. Margaret Murray The God of the Witches, publ Sampson, Low, Marston & Co Ltd, London (approx 1921). 2. Miranda J Green Dictionary of Celtic Myth and Legend, Thames & Hudson 1997.